Nature is in the air. 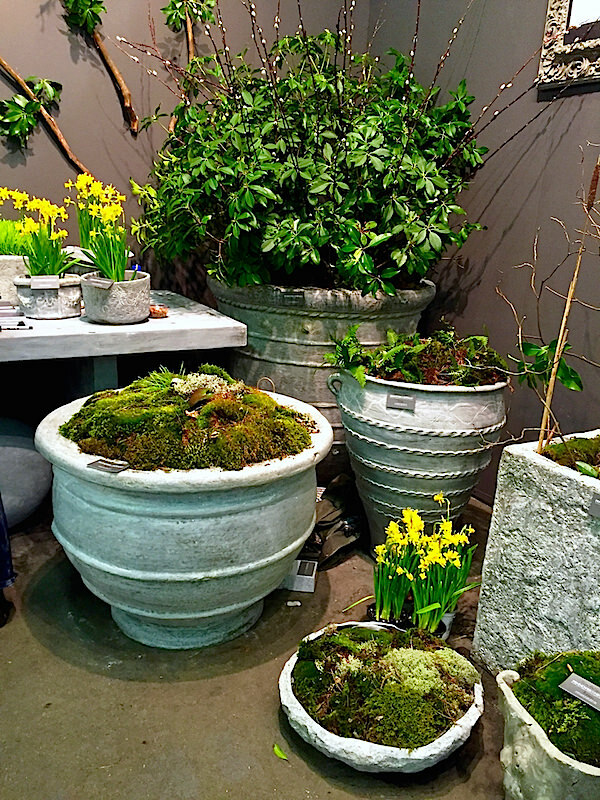 And not just because it’s almost spring but because going green with natural themes seems to be a trend both on the runway and at home. 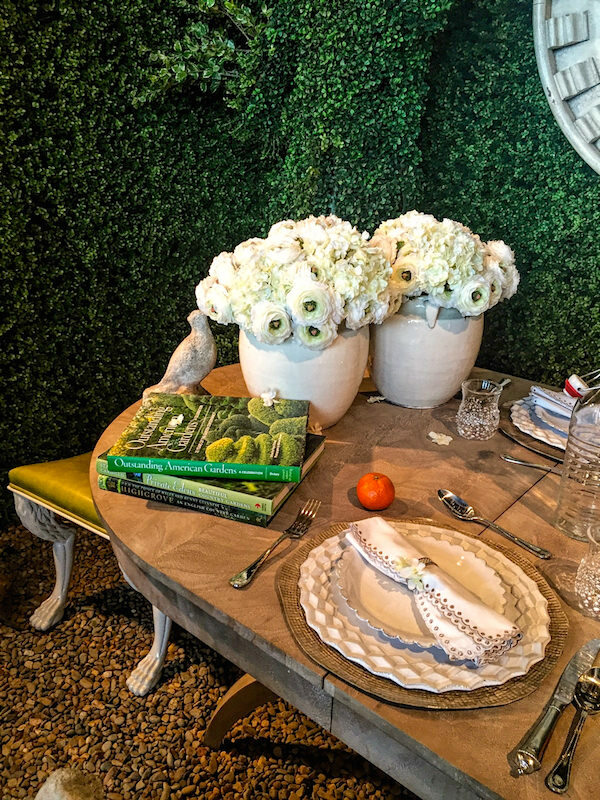 While I will be back to report on favorites from both this year’s Architectural Digest Design Show and DIFFA‘s Dining by Design, here are a few picks from each showing that going green is a good (and stylish) thing. 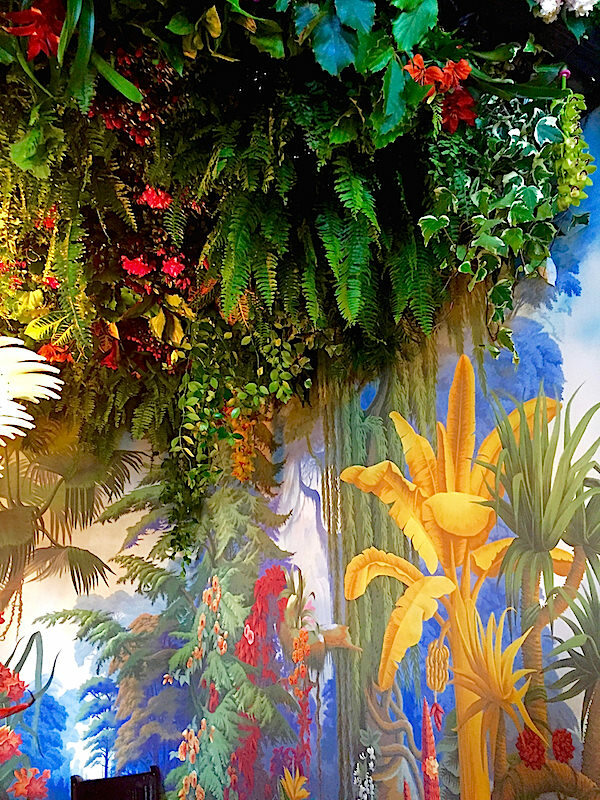 Sasha Bikoff‘s installation for Luxe Magazine with LIAIGRE utilizes a living ceiling and de Gournay‘s exotic Le Eden wallpaper to evoke the lush landscape of a tropical rainforest. 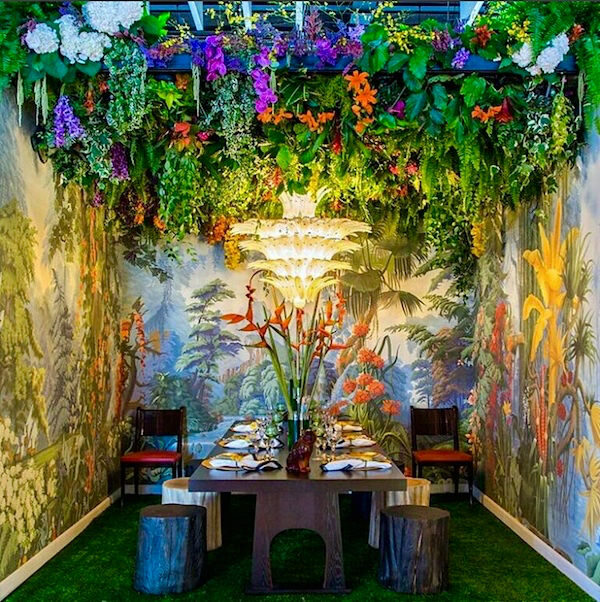 A mid-century Italian Murano chandelier and LIAIGRE furniture with grass floor complete the luxuriant Garden of Eden. Artistic Tile is a family run business that offers full service custom capabilities. 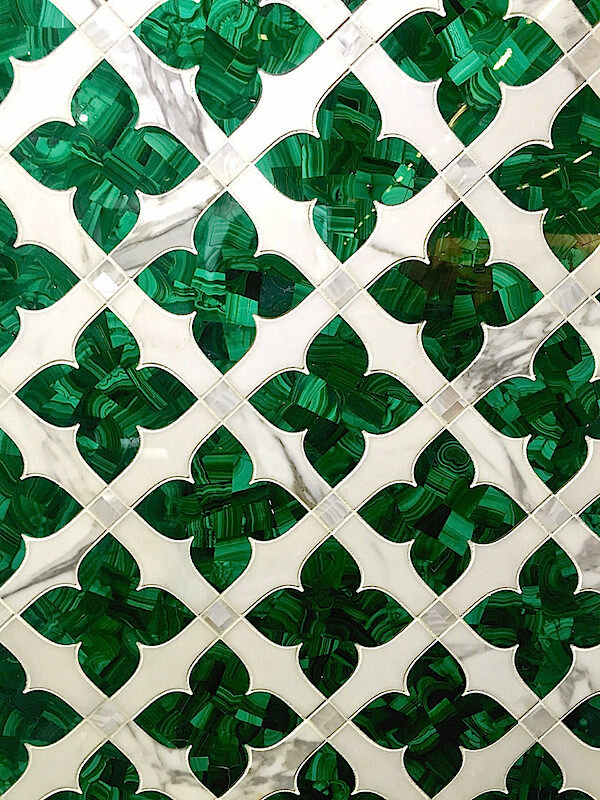 Cut with water jet precision, this beautiful mosaic features malachite, marble and mother of pearl. 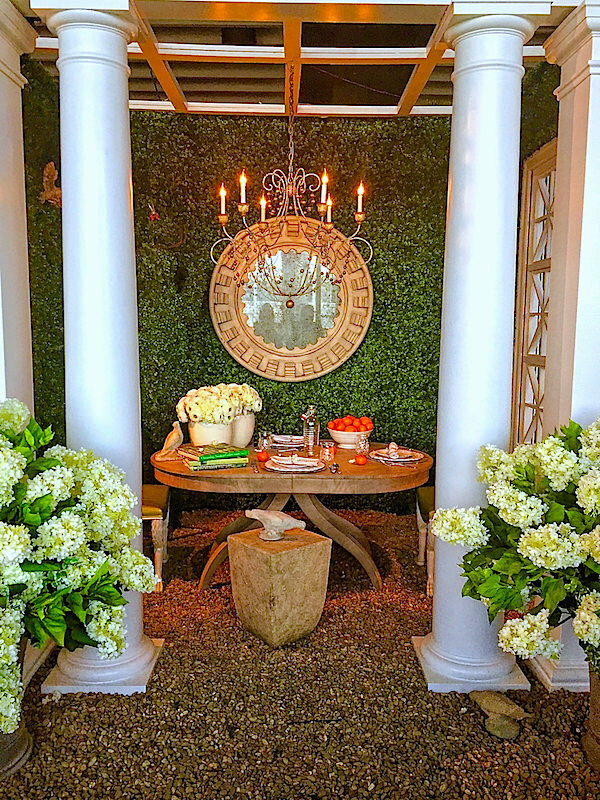 For New Growth Designs, Mary Douglas Drysdale created a charming garden dining pavillion. With a classic architectural folly built by Black Millwork, Trieste Chandelier by Niermann Weeks, Newman Table and Nob Hill Stools by Theodore Alexander, and additional furniture and accessories by Holly Hunt, and Dessin Fournir, it was a green oasis anyone would be delighted to visit. 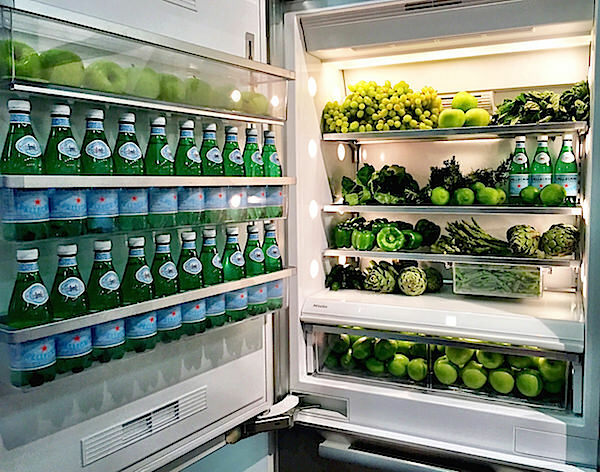 We’ll circle back to visit more with Miele but I couldn’t resist sharing their impeccably styled and well organized refrigerator. Going green never looked so healthy or delicious at the show. As we are all anxiously anticipating the warmer weather here in the northeast, ICRAVE for Design Within Reach imagined a poolside table at a Californian desert retreat. At that golden hour of early evening when a cocktail is called for, “Palm Springs utopian modernism” looked mighty appealing at Pier 92. Those of you who follow along on social media may have seen me post this as a nod to St. Patrick’s Day. 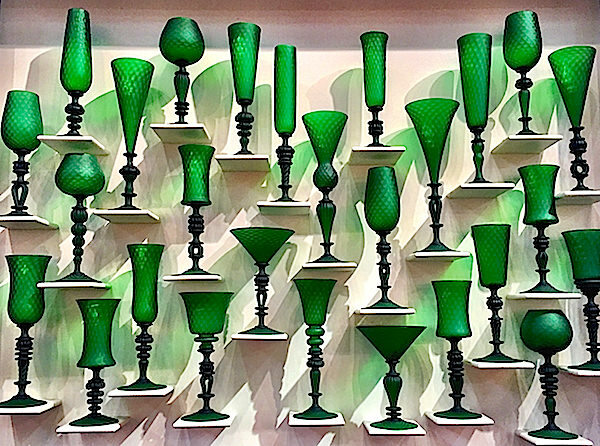 Kenny Pieper‘s exquisite handblown glass looked glorious en masse in this saturated shade of green. 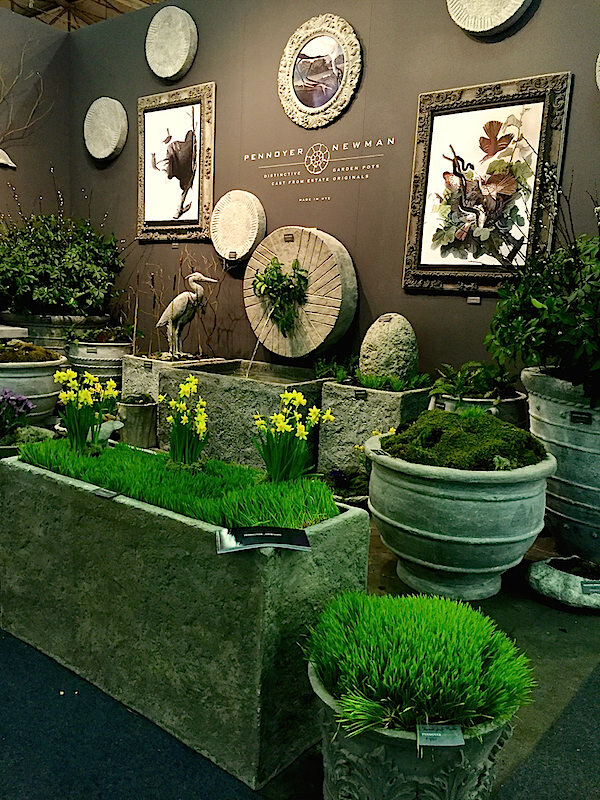 Going green isn’t hard at Pennoyer Newman, where their handsome estate inspired vessels enhance both house and garden. Their new Alpine Troughs, below front, recreate the texture and appearance of granite for a rustic chic look that can easily mix with any other style. The Millstones on the wall are great for garden walls, steps or outdoor decoration but can also be used with custom-installed spouts as fountains. 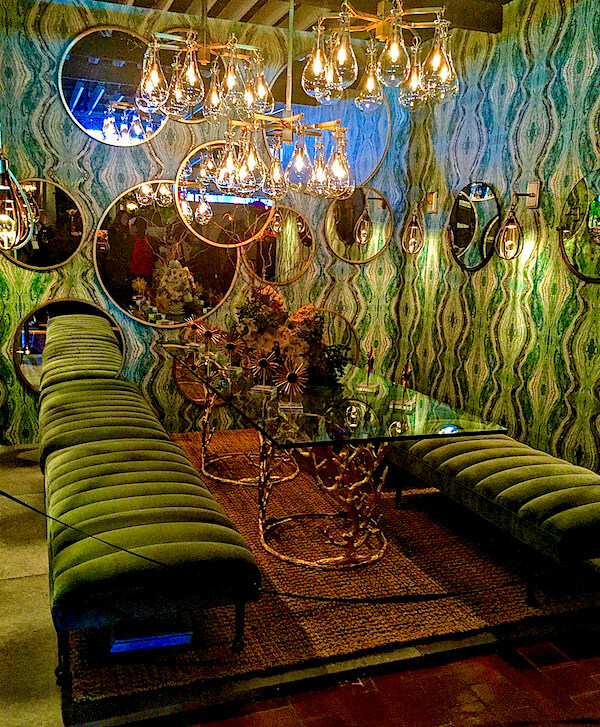 Arteriors Atlantis-inspired table captured the greens and blues of the legendary lost city. The gilded finishes of the Kira mirrors, Athena Sconces, Sabine Chandelier and gold leaf finished Omari sculptures offered glimmering glances of abandoned luxury while the organic shape of the Ursula Dining table and channel tufted Christophe Bench helped transport us to the underwater uptopia. Longtime favorite Audrey Sterk introduced a new finely ribbed subtlely metallic grasscloth base for her wallpaper collection that imbues it with a slight shimmer and more three dimensional hand. 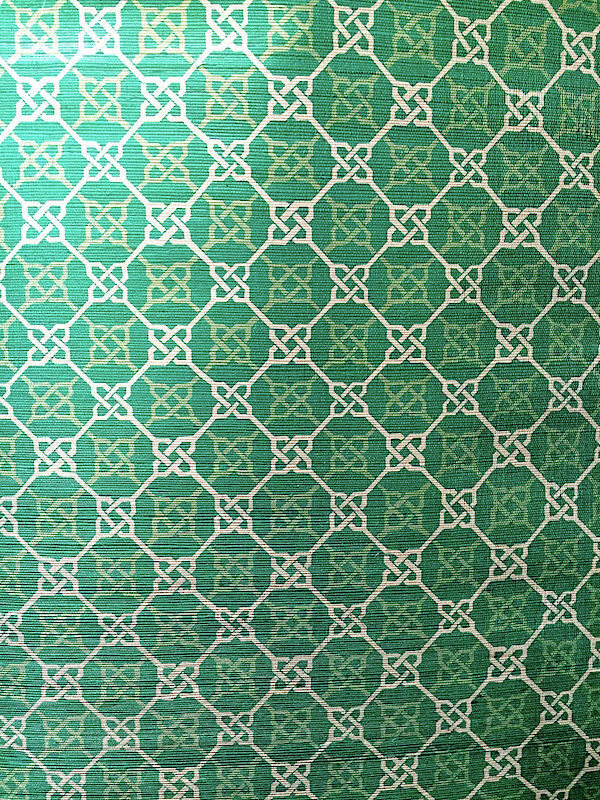 She introduced one of her most popular patterns, Links, on the new material in a grassy green colorway that would add nautically inspired pattern and life to any space. Of course it can be custom colored for any project. KGBL is dedicated to the production of modern furniture classics. 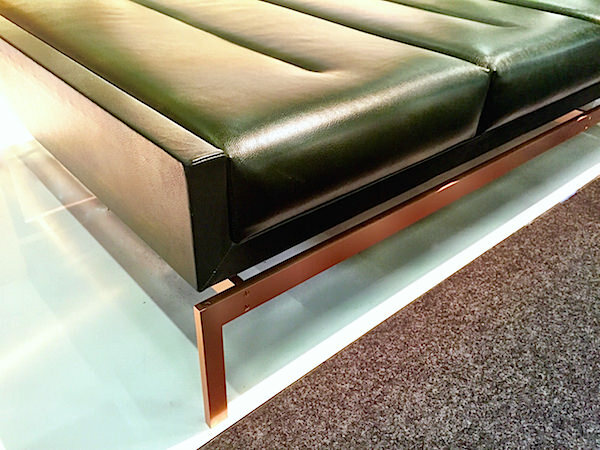 As they say, “Unless it brings something new to the bigger design conversation, it is not worthy of the collection.” With refined lines and uncompromising production, their beautiful Olivera Chaise Longue perfectly fits the bill. 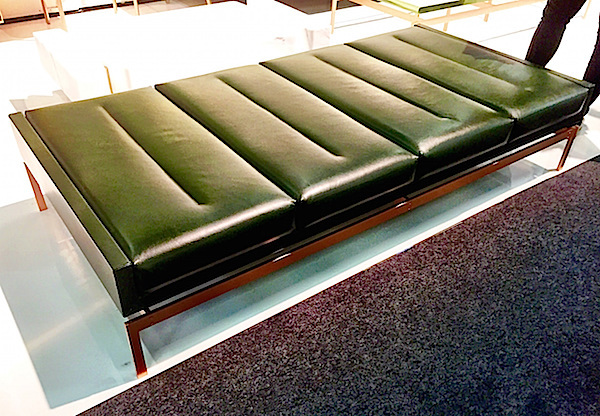 Shown in Balsam leather with a solid copper base, its elegant scale and proportion make it an ideal addition to almost any space. 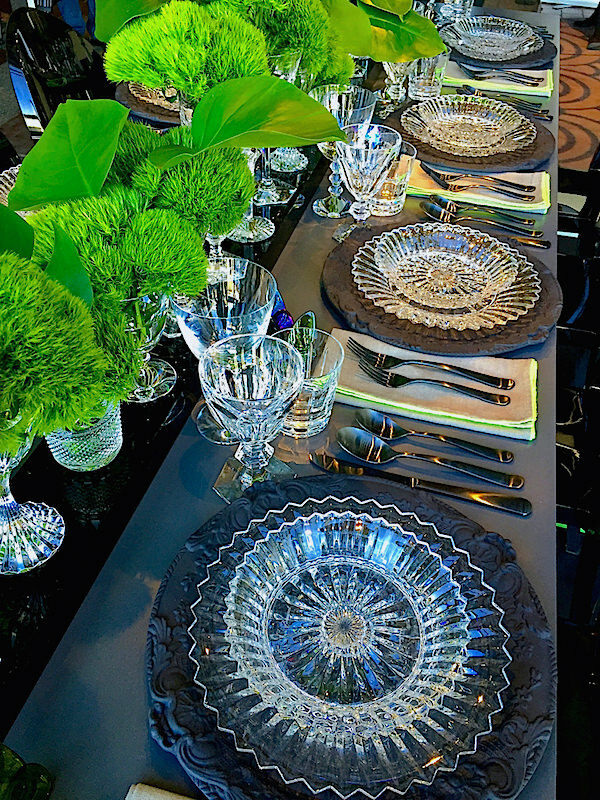 For Modern Luxury’s Manhattan Magazine, Baccarat designed a table mixing timeless elegance with modern chic. 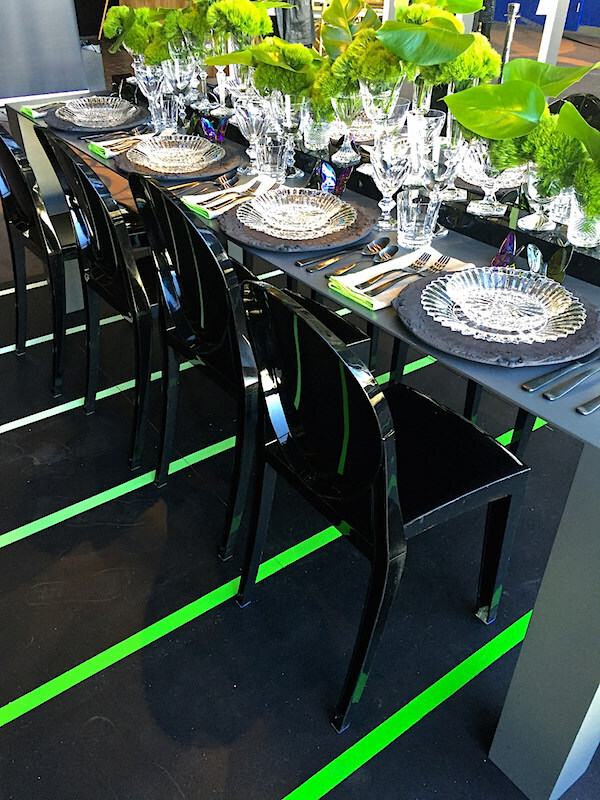 A sleek black and lush green scheme accented with a glistening mix of crystal stylishly combined classic with contemporary – from the evocative magical mystery of the modern Mille Nuits to the bold lines of the 19th century Harcourt. 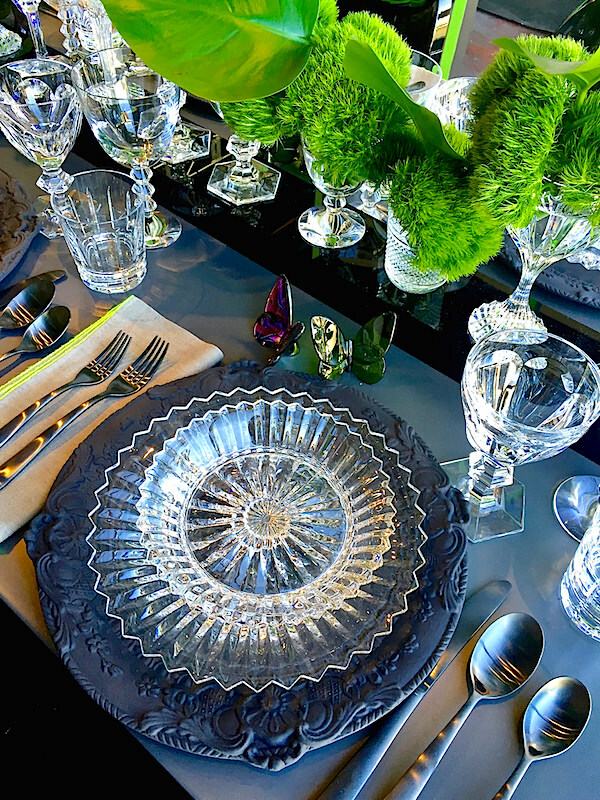 Of course it wouldn’t be a nod to the luxury of spring without Baccarat’s iconic Papillon Lucky Butterfly! Brooklyn based Flavor Paper collaborated with designer Ghislaine Viñas for their new exuberant Wild Thing paper. 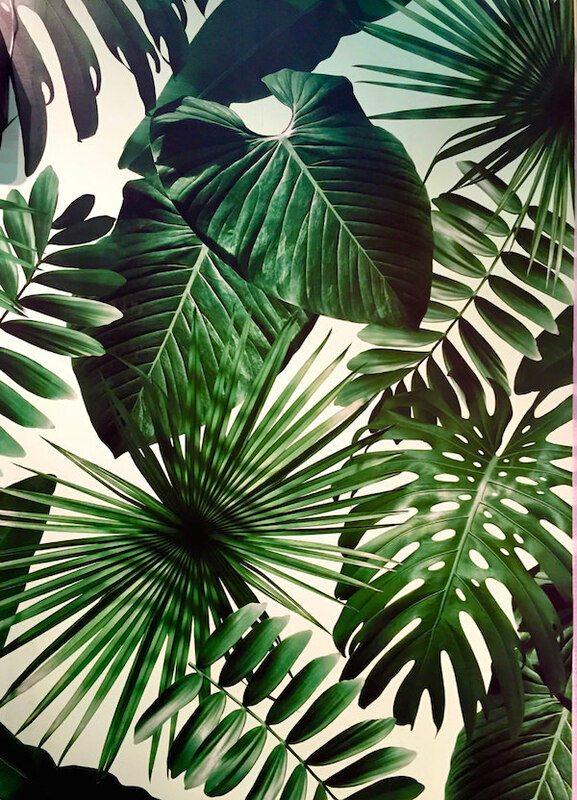 Going green banana leaf style would transform any room into a tropical paradise. 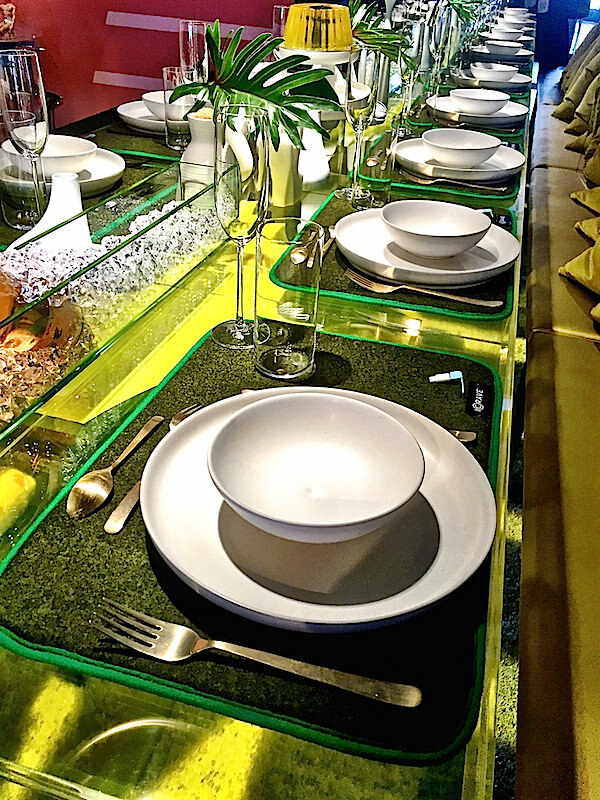 Stay tuned for more from the AD Design Show and DIFFA’s Dining by Design! This entry posted in design, interior design. Entry Tags: AD Design Show, Architectural Digest Design Show, DIFFA, Dining by Design, green, Tabletop Bookmark the permalink. Stacey, I really enjoyed your incredible post, I have been hoping to find some re-caps of the AD show since I could not attend this year. I especially love the vignette by Mary Douglas Drysdale as well as the Arteriors Atlantis creation, the wall paper, mirrors and Ursula table are sublime. Another favorite the is the Artistic mosaic tile. What a nice place. Everything is so green. I love it. Feel like amazonian forest. Mary Douglas Drysdale design is my favorite. So ancient.